1. 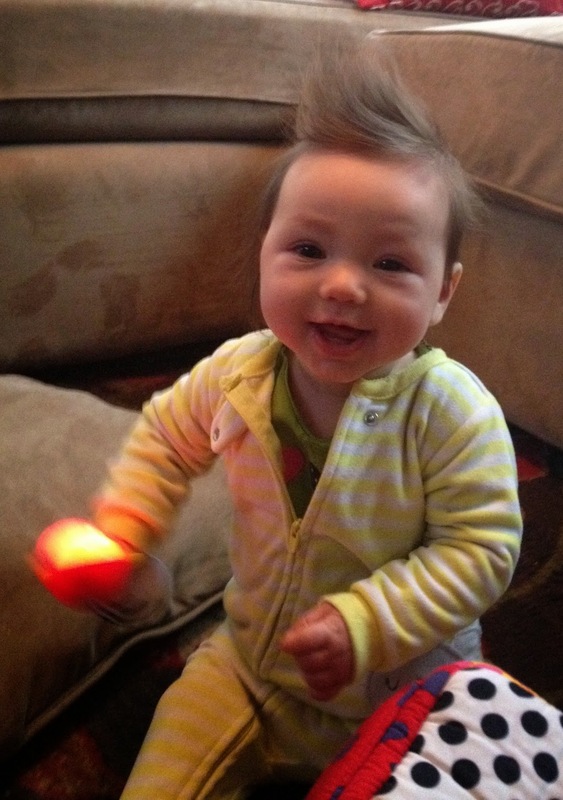 NogginStik Developmental Rattle- We were sent this light-up rattle for Adalyn to review and she loves it. It changes color and can be red, green and blue. This can help encourage visual tracking for baby. It has different textures on it which is fun for baby. It is good for ages 0-12 months. We handed Adalyn this rattle and she loves it. She shakes it and enjoys seeing the colors change. This would make a fun baby shower gift. My husband sent me this picture of her playing with it when he was taking care of her over his spring break- look at that hair!! 2. Earth's Best Organic Baby Foods- For the most part, I am making Adalyn's baby food except when it comes to cereal. I have been buying her the Earth's Best organic whole grain oatmeal. The reason that I bought this oatmeal is because it contains iron which is necessary for breastfed babies after 6 months. I like that it is whole grain and healthy for her. Adalyn likes this cereal and has eaten it with berries and another time with cinnamon. I usually mix it with water but if we have extra pumped milk, I will add that. Adalyn has been enjoying all of these cereals. Right now, I make her food but I love these pouches for when we go out and I need some food for her. It is easy to transport and less messy. Love some of these combos of spinach, lentil and brown rice, butternut squash pear, etc. I would make these myself and love that they are organic. For me, I usually try to eat healthy but it is a whole another level with Adalyn. I care so much about her and I know that she needs excellent nutrition to grow so I am trying to only provide her with the best foods (no, I will not deprive her of sugar once she is old enough for it but it is too soon!). 3. Nursing Bra Express Bra- This product is not for Adalyn of course but it is very important for feeding her! I am super picky when it comes to nursing bras. In fact, to be honest, I have been wearing Coobie and Handful bras almost everyday since Adalyn was born which neither are nursing bras. I had issues with each of the nursing bras I tried. I was contacted by Nursing Bra Express to try their new Nadia Padded Underwire Nursing Bra. It is affordable at just $24 (many nursing bras are over $50). It is underwire which I know that some people do not like. I feel like an adult again wearing a real bra! It is great for nursing and can easily be unclipped and for pumping, I leave the bra on and put the pump parts right into the bra. Of course, you are not supposed to sleep in a bra and I did and found it to be not comfortable for that (duh!). Another FYI about this bra is that it runs a complete size too big. For example, if you are a 34C, you need to order a 34B. Overall, I really like this bra and am happy to have found a nursing bra that I like.